The coasts of Antarctica are ringed with ice shelves–massive expanses of ice floating on the surrounding ocean that form the outermost extensions of the glaciers that cover the land behind them. Many shelves appear to be thinning with climate change. Now, a new study shows that even minor deterioration of ice shelves can instananeously hasten the decline of ice hundreds of miles landward. The new research is the first to quantify the inland impacts of thinning ice shelves in a systematic manner. Glaciers are basically rivers of ice, slowly, constantly pushing their way to the sea. 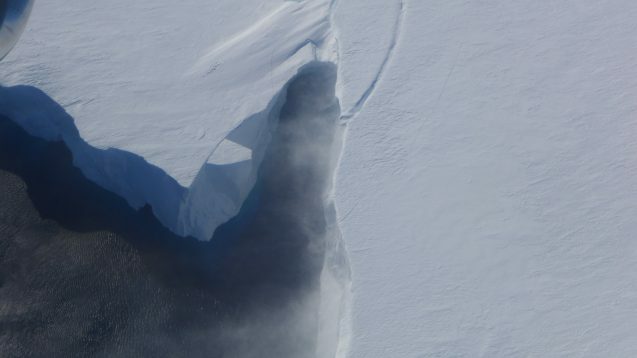 In Antarctica, ice shelves are thought to act as buttresses, helping slow down this flow.. Thus scientists fear that as they deteriorate, glaciers will speed up and feed sea-level rise. So far, it has been generally assumed that this would happen only if the shelves melted back to the hinge point where they are anchored to land–the so-called grounding line. But in the new study, scientists found that melting in the middle or even near the fringes of ice shelves can increase glacier flow far away. The study appears today in the journal Nature Climate Change. The researchers showed that in some areas, deteriorating ice can send a signal as far as 900 kilometers (560 miles) landward, speeding glacier flow. “While our approach is purely diagnostic and cannot be directly translated into a forecast of ice-mass loss, it shows the risks we run in Antarctica if we do not limit heating up our planet,” said coauthor Anders Levermann of the Potsdam Institute for Climate Impact Research (PIK) and Columbia University’s Lamont-Doherty Earth Observatory. The air above most of Antarctica is almost always below freezing, so that is not the main problem for ice shelves. Thinning appears to come mainly from relatively warm ocean water that gets get into cavities beneath the ice shelves and melts them from underneath. Because the shelves are already floating like ice cubes in a glass of water, sea level does not rise when they melt. But when grounded glacial ice streams reach the sea, that does raise the level. In recent years, scientists have observed that some Antarctic glaciers have indeed speeded up–the main reason that Antarctica is already contributing to rising sea level.